Funerals are hard to deal with. The loss of a loved one is difficult and so is planning their funeral procession. Planning a funeral is difficult as you are already dealing with enough stress due to the loss you have just faced. Funeral templates can assist you in organizing a funeral procession in a short time. The below-given funeral program templates can help you with various aspects of a funeral procession and will make it easy for you to plan the program. 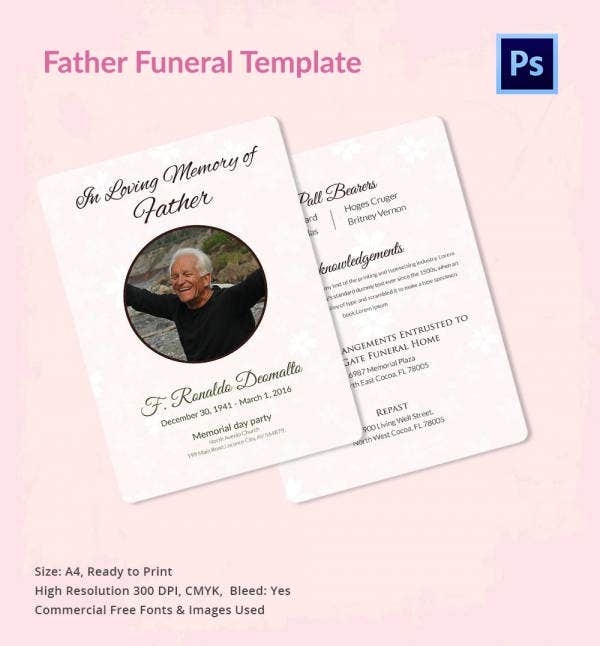 This is a funeral program template which can be used to make a card which contains the obituary for the person who has passed away and details the funeral program. 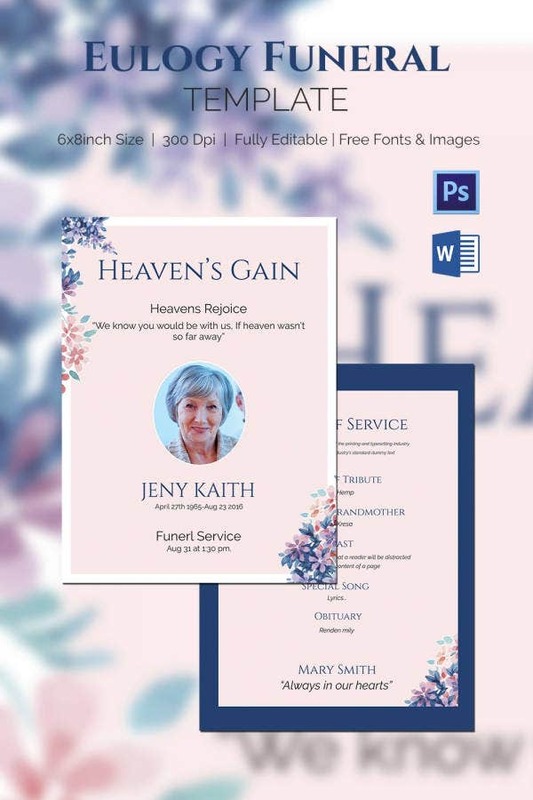 This funeral program mother template can assist someone whose other has passed away recently. The template comes in A4 size, 300 DPI, and PSD format and the Word file is fully editable. 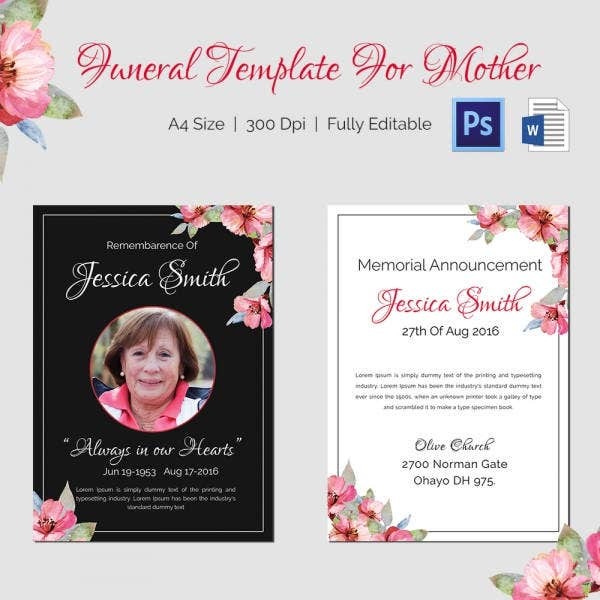 If you need help in writing a funeral message regarding your or someone’s mother’s demise, you can take help of this funeral program template. The template can be fully edited. 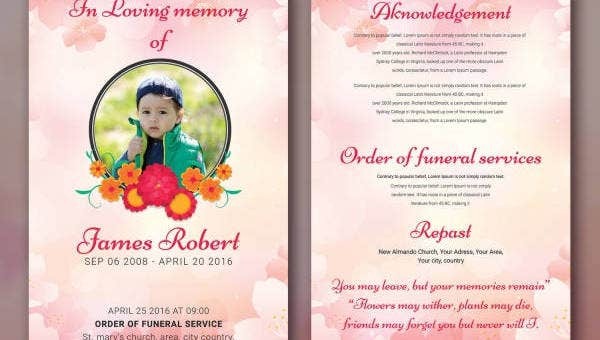 > Who can make use of these funeral program templates? The funeral program templates should be used when someone has passed away and you need to conduct a funeral service for them. 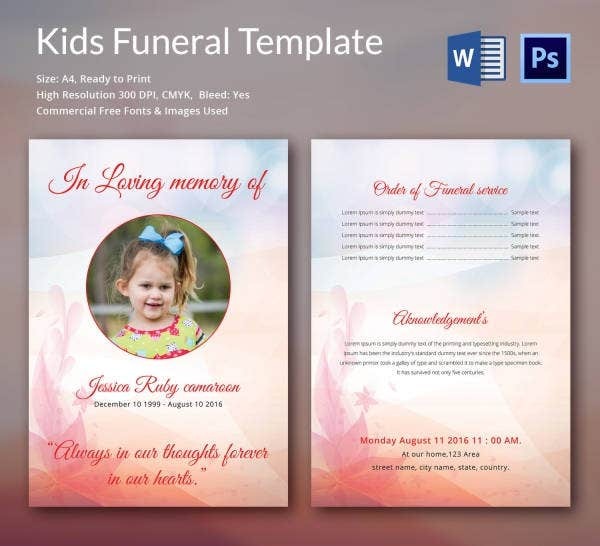 These funeral program templates can be used for different purposes. 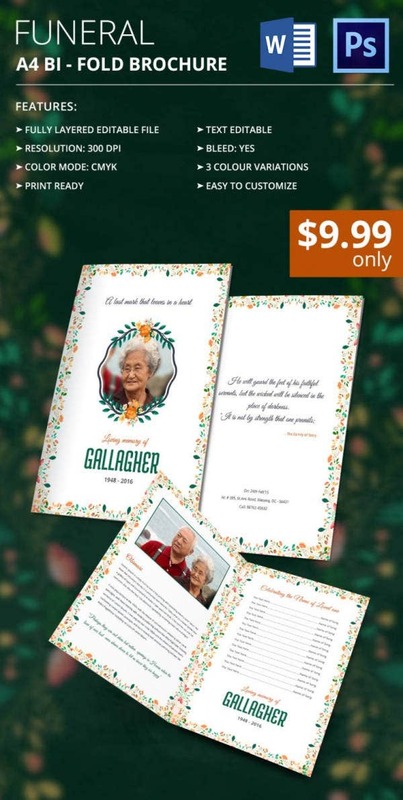 You can use them to make cards for inviting people to attend the funeral service of the deceased. You can also make use of these templates to make clippings regarding someone’s demise to be published in a newspaper or a magazine to inform different people regarding the person passing away. 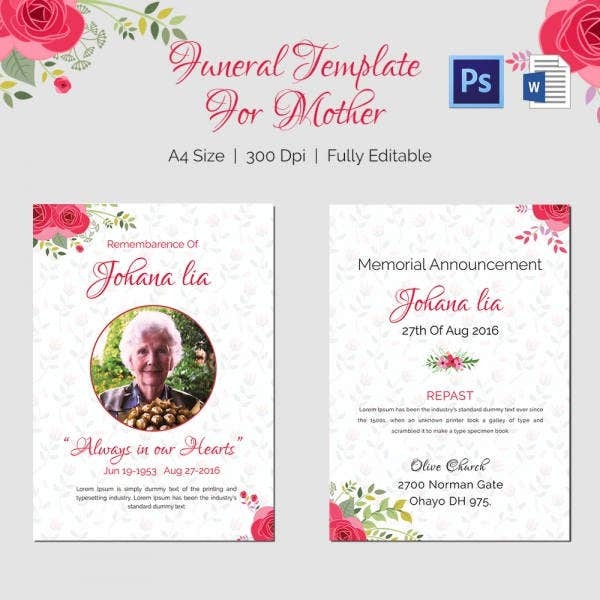 Some templates are specifically made for instances of someone’s mother passing away and hence should only be used for that purpose. 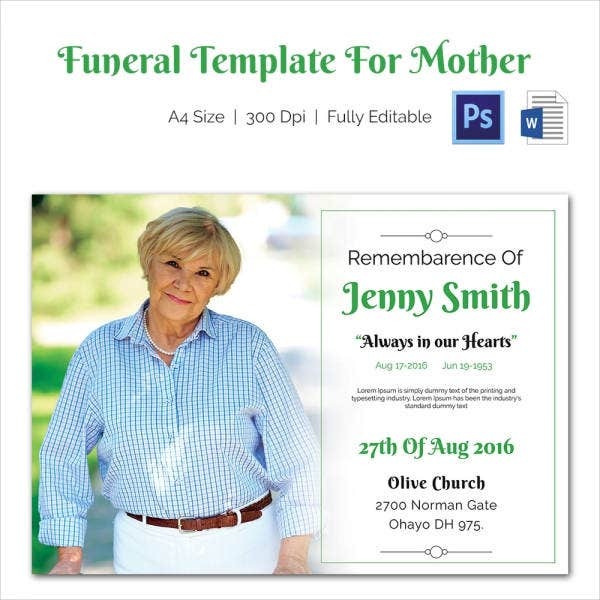 This is a funeral template which can help you in making a card for someone’s funeral service. It comes in 6*8 inch size, 300 DPI and it can be fully edited. 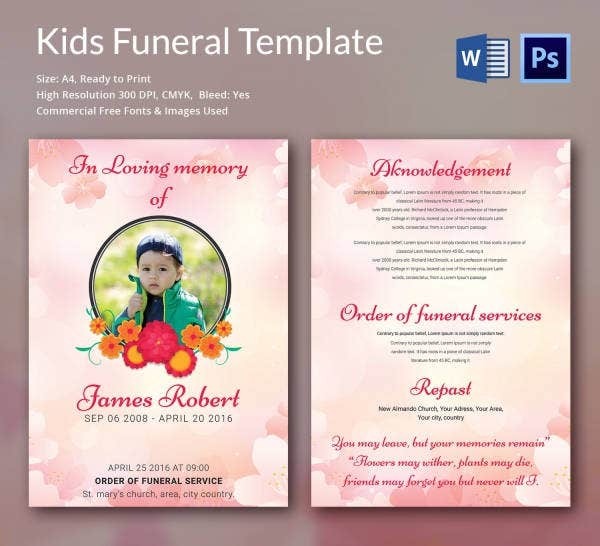 > How to use the Funeral Program Template? 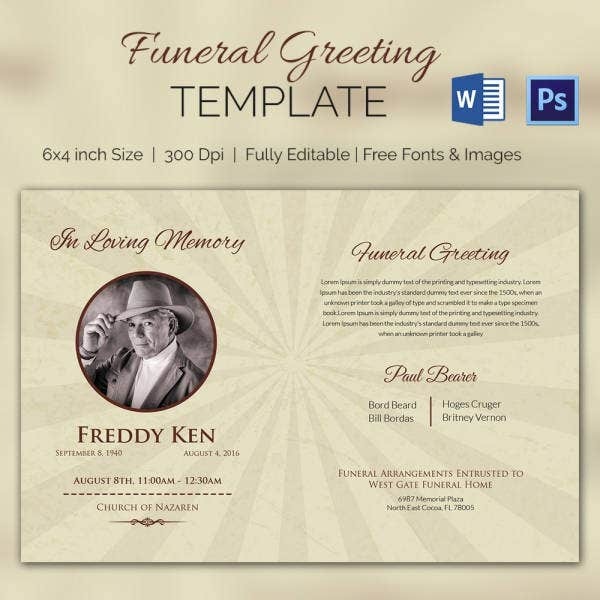 Funeral program templates are to be used as editable templates. After selecting the template you have to edit various parts of it. First, you have to edit the name of the person who has died. Then you have to replace the photo of the person in the template with that of the deceased. After this, the obituary given in the template should preferably be replaced by your own. Then you should edit the date and venue of the funeral procession along with the details of the program. All these changes can be made by using Adobe Photoshop. 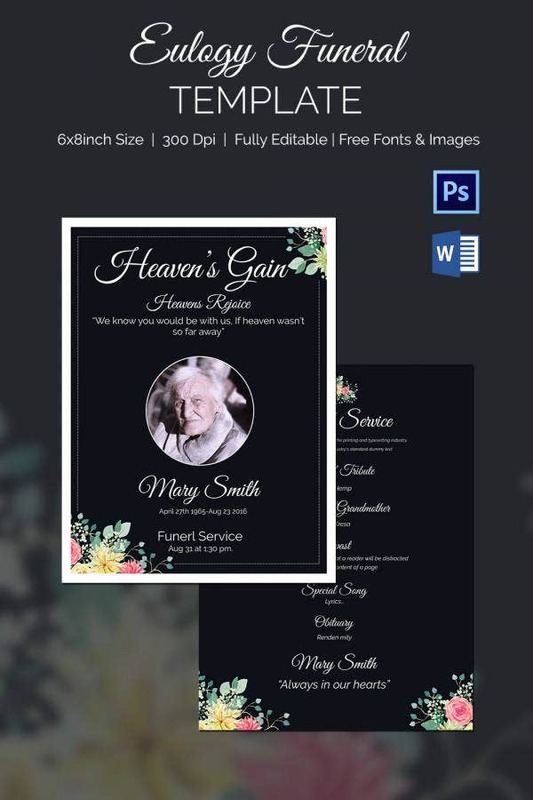 Obituary program templates and memorial program templates are similar templates which can help you with different aspects of a funeral. The above-given templates are very well designed and you should use them for planning the funeral program. All the templates are fully editable and come in high definition and different sizes.